Show your love this World Give a Book Day! The best gift you can give a child is a love of reading. ITEC is giving a loving gift to children in our Grade 4 Book Club. We are giving ten children a book to own and keep for ever. 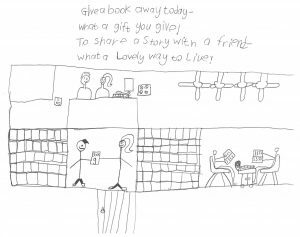 Khazimla, one of the children in the Book Club, designed this awareness poster. What a profound idea is shared!